Some controls that render text include a TextDecorations property that allows you to underline the text or draw a line through the middle of the text. 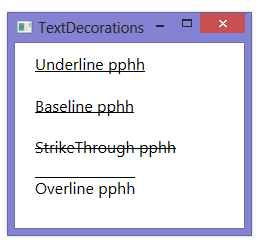 Below is an example of the TextDecorations property used with the TextBlock control. TextDecorations is not supported for Labels. <TextBlock Text="Underline pphh" Padding="20,10" FontSize="16"
<TextBlock Text="Baseline pphh" Padding="20,10" FontSize="16"
<TextBlock Text="StrikeThrough pphh" Padding="20,10" FontSize="16"
<TextBlock Text="Overline pphh" Padding="20,10" FontSize="16"